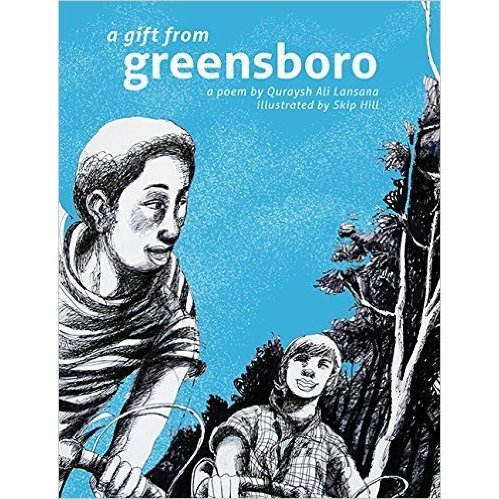 Today we have the pleasure of featuring Quraysh Ali Lansana, author of the poetry collection, A GIFT FROM GREENSBORO (Penny Candy Books 2016). Be sure to enter the giveaway for a copy of the book. My first poems were born on the canvas of endless sky in Enid, OK in 1964, written with the sweat & tears of a lower working class Black family in a state with some of the nicest racists one could ever meet. And so many good people too. I have four older sisters and two older brothers. My oldest sibling is 20 years older than me, and my sibling closest in age is four years my senior. My sisters and brothers were ideas & elusive confidants. They fed me language, music & the necessity of dreams. As did my first favorite poet, singer/songwriter Stevie Wonder. Letters are symbols for sounds, like musical notes. Once constructed they create sound and sense. Then words, carefully arranged, carry music and meaning, like melodies and rhythm. I have loved language, in its myriad vehicles & tongues, my entire life. So I write poems, essays, and journalism. I also write plays, books for teachers and children’s books. I like writing children’s books because if I can help a child think about themselves and others with respect, knowledge & empathy the world might have a better chance of becoming hospitable. Congrats on your book, A GIFT FROM GREENSBORO. Tell us about it & how you came up with this idea. AGFG is an autobiographical poem which fuses two deeply impactful memories with my two earliest, closest “brothers from other mothers,” both White men & regrettably, both deceased. I met Russ Hutchison in the third grade on a basketball court. We reconnected in sixth grade when my school was closed due to desegregation. Every Saturday for four years we rode bikes downtown, which included a long library visit and Woolworth’s. We’d get lost in the store, then settle at the lunch counter for cheeseburgers & milkshakes. This was a decade after the passage of the 1965 Civil Rights Act, yet not everyone was welcoming of me with Russ eating fries. Tod Lilburn & I met my first day of class at the University of Oklahoma in 1982. He was wearing a t-shirt of one of my favorite bands, The English Beat, one of the seminal bands of the British Two-Tone Ska movement on the 1980’s. Two-Tone Ska bands blended early reggae music with pop while singing about racial equality in racist lower working class areas near London. We bonded immediately, and were both Radio/TV/Film majors. When Tod was a news photographer for a Winston-Salem, NC TV station he was sent to shoot a story on the closing of the historic Woolworth’s store in Greensboro, NC, the birthplace of the Sit-in movement in the South. While at the store he bought a coffee mug for me as a symbol of our bond. You cover a lot history in the book. And it’s free verse. Wow. Tell us about your research process. I am a student of history. I like to connect the dots between the past and the present, how one informs the other. I believe that research, in addition to revision, are the most important aspects of the creative process. Since this is largely autobiographical I mined memory as well as researching the history of my hometown and the history of the Sit- In movement. Also the Civil Rights movement as a whole. My illustrator and I wanted to highlight both the tension and the love of that period. Though my Woolworth’s trips with Russ occurred in Enid, Skip and I needed to study the history and emotions of Greensboro to make the book work. I just completed a study guide companion book for SEASONS: A GWENDOLYN BROOKS EXPERIENCE, which is a new collection of poems by Miss Brooks published this year, marking the 100th anniversary of her birth. I will soon complete the manuscript for my first collection of new and selected poems. I have another children’s book in the works, titled LOGIC. Also, I have another big project, but will keep that a secret. The hardest part of writing for me is keeping up with my thoughts. If I don’t write them down immediately they will vanish, or linger but something always gets lost. The easiest part is that I rarely tire of ideas. Feed your imagination in every way that is safe and positive. Immerse yourself in all arts and actually talk to people. Get off the cell phone and listen to people. I believe that listening is the greatest tool for artists. I suppose one thing most people don’t know about me is that I like Rock music. I am a huge fan of Hip Hop, Reggae, Soul, and played jazz tenor saxophone for years. But not many people would expect me to like Rock and Roll, particularly Rock from 1950 through the 1990s. Quraysh Ali Lantana is the author of the poetry collections A Gift from Greensboro (Penny Candy Books, 2016); mystic turf (2012), They Shall Run: Harriet Tubman Poems (2004), and Southside Rain(2000); his chapbooks include reluctant minivan (2014), bloodsoil (sooner red) (2009), Greatest Hits: 1995-2005 (2006), and cockroach children: corner poems and street psalms (1995). He has also written a children’s book, The Big World(1999). He is the editor of Glencoe/McGraw-Hill's African American Literature Reader(2001) and a number of other editing projects and anthologies. 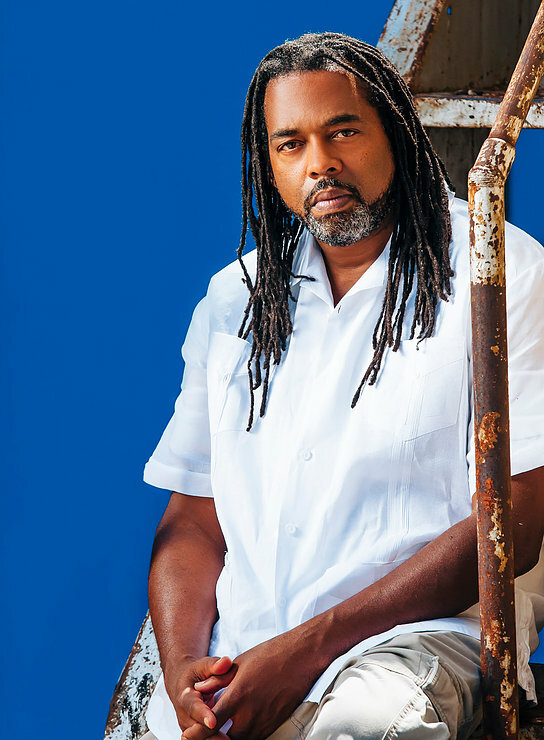 Lansing has been a literary teaching artist and curriculum developer for over a decade and has led workshops in prisons, public schools, and universities in over 30 states. He is a former faculty member of the Drama Division of The Juilliard School, and served as Director of the Gwendolyn Brooks Center for Black Literature and Creative Writing at Chicago State University from 2002-2011, where he was also Associate Professor of English/Creative Writing. Currently, Lansana is on faculty in the Creative Writing Program of the School of the Art Institute in Chicago and the Red Earth MFA Creative Writing Program at Oklahoma City University. I enjoy your reason for writing for children and agree this is so important. I think books are some of the best ways kids can see themselves and get to know others. The more I know about other cultures, the more understanding I become.